When you go to buy Kentucky Derby tickets online, it can be difficult to decide which tickets you need and which ones are available. November 24-27 was closing weekend for 2011 and opening weekend was April 28, in 2012, and now, we are in a new year, 2013, and with the opening of the 2013 Kentucky Derby tickets going on sale on November 14th, 2012, so as you can see, the Kentucky Derby tickets are on sale throughout the year almost. With tickets advertised from $25 to $5,000, it pays to know the specific language and terms used for tickets and seating at Churchill Downs. Unlike its Triple Crown counterparts — the Belmont Stakes and the Preakness, who’s tickets are fairly easy to come by — reserved seat tickets to the Kentucky Derby are a hot commodity. Currently, it requires a ‘lottery’ process to allocate the reserved seat tickets that become available though a good percentage end up in the hands of longtime attendees — prominent horse racing personalities, well connected ‘old money’ Louisville families and corporate sponsors. Additional reserved Kentucky Derby tickets are released online a predefined times in advance of the race and available on a first come, first served basis. In addition to the reserved seats, tens of thousands of fans attend annually with general admission seating available throughout the facility. General admission tickets are priced from $25 to $40 for Kentucky Derby Saturday, with separate admission necessary for the Friday racing card headlined by the Kentucky Oaks. The 2013 Kentucky Derby will be held on May 4. Interestingly, this is not a one-day event. The day before, on May 3, the female horses will be running their own derby called Oaks Day. When you are preparing for your first Kentucky Derby, keep in mind that you will need to select the correct day or days. If you only want to see the main Kentucky Derby event, be sure you buy derby tickets for Saturday. Also, remember that races do not begin at an established time. For example, if it has been raining, the Derby may start anywhere from 11 AM to 6 PM. Many people are not aware that the ticketing at Churchill Downs goes in several directions. When you visit their website, you will see a suggestion for the General Admission, Season Box Membership Program, Personal Seat Licenses, and the Turf Club at Churchill Downs. Does this have anything to do with buying tickets to Churchill Downs for just one day? At the bottom of the main ticket screen at the Churchill Downs website, you will see a link for Kentucky Oaks and the Kentucky Derby ticket request. Regardless of what you see, do NOT get distressed about the following. It is seemingly bad news – but it is not over yet. The unfortunate part is that when you click on the links, you will see a depressing note that says, “Thank you for your interest in the Kentucky Oaks and the Kentucky Derby. The request period for 2012 Kentucky Derby and Oaks reserved seats has ended”. 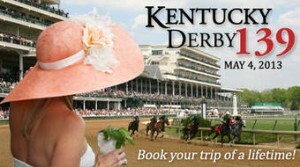 Now, you can get your 2013 Kentucky Derby tickets, as they started going on sale on November 14th, 2013. Under no circumstances, after reading the above quotation, should you assume that your chances of visiting this event are over. Once you understand the ticketing for the Kentucky Derby, you will see why you should maintain high hopes. For example, the language used by ticket holders on Craigslist.org will be easier to understand if you go directly to the source of this terminology. In particular, the main tickets that someone holds are grouped into General Admission, Season Box Membership Program, Personal Seat Licenses, and the Turf Club. If you attempt to buy your tickets from scratch, you will need to do it with plenty of time in advance. Most of the tickets sell out at least 6 months in advance and must be requested. If your request is granted, then you are eligible for one of 48,500 seats. For the elite membership holders, they have a choice of paying $2,250 for six seats on the upper level of the grandstand. Of course, you do not have to pay a hefty price to see the Kentucky Derby live. The exception is the general admission or “Infield” option. General Admission – This is also called the “Infield ticket” by locals. Your ticket for Oaks Day will be $25, and for the Kentucky Derby, tickets are $40. Basically, this pass gives you access to what is called the Paddock areas, the center of the racetrack, and any space that is designated as a Standing Room Only area. Season Box Membership Program – This selection offers season boxes on the third floor and has a great view of the race. To get involved, your annual fee would be from $3,000 to $4,300. You would also have a chance to request tickets to the Derby. Turf Club – There are various tiers to this type of membership. At levels 1 and 2, you have the opportunity to purchase a third floor Clubhouse Box for Oaks and Derby. For level 3, that option is increased to first floor box for Oaks and Derby based on availability. Personal Seat Licenses – This type of ticket is for the entire Kentucky Derby season starting in April and ending in November. Included is a one-time fee that gives you a chance to request Kentucky Oaks and Kentucky Derby tickets for a period of time over 3 or 5 years. This means that you pay between $3,000 to $75,000 up front. After that, if you want to reserve a seat for the Derby or Oaks, it is $261 to $1,240 each. Kentucky Derby Tickets and Hotel Packages? There is a variety of hotels in Louisville, Kentucky that are specifically associated with packages for the Kentucky Derby. When you see the price tags of $2,500, you start to wonder if tickets are included. However, if you read through the literature closely, you soon see that tickets are a separate price. In other words, the hotels are not going to help you get your Churchill Downs tickets. Instead, you get your tickets and then you can buy your hotel package for Derby Weekend. While the Kentucky Derby is May 3-4, most people will buy a four to five day hotel package in order to avoid the traffic. Thankfully, most luxury hotels in downtown Louisville are only a short 4 miles from the track with plenty of taxis in between. If you are interested in air flights to the Kentucky Derby, then you should definitely go to our page and read more about it, as well as if you are interested in Kentucky Derby Hotels, which you should also read about. If you’re not able to make it to Churchill Downs on race day, there are plenty of places to watch and wager on the Kentucky Derby. Most horse racing facilities across the country offer simulcast wagering not only on the Derby, but the entire spring and fall race meet at Churchill Downs. You’ll also find the race itself on NBC TV in the United States and can get plenty of pre-race coverage on the dedicated horse racing networks TVG and HRTV. Every race book online or in Nevada will be taking action on one of the major events of the thoroughbred racing calendar.